If you know my husband then you'd probably know he does not like reading books. It puts him to sleep in minutes. But I was surprised when he grabbed my copy of New Moon and started reading beside me (Someone should've taken a picture of us beacause I was reading Breaking Dawn for the nth time hahaha!). Mind you, he didn't fall asleep. He even reluctantly put the book aside after reading several chapters because he has to work early later. @Toni No not yet hahaha. 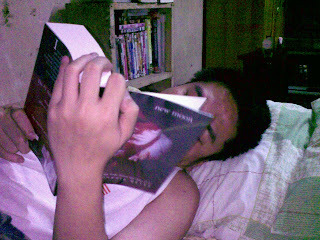 He's still reading New Moon trying to get to read the book in between his hectic schedule. B ut I'm psyching him up for Breaking Dawn careful not to give out any spoilers hahahah!